Minimising downtime during the holiday season: 7 questions to ask your payments partner. The holiday season is just around the corner and with it comes the onslaught of one-day sales such as Black Friday, Boxing day and Cyber Monday. Businesses across the world design marketing strategies months in advance to attract a maximum number of customers to their retail and online stores during the holiday season. But, with the influx of customers comes the necessity of ensuring that your platform can handle the increased traffic. Payment system downtime can be a big spoiler for the most important sales days for businesses. And yet, every year well-known brands continue to make headlines for crashes during these peak times, costing millions in lost revenue and damage to reputation. Apart from the obvious consequences, the effects of payment system downtime could be long-lasting. Here are a few highlights from our report focusing on the effect of downtime on businesses across industries. It is no surprise that payment system downtime costs dearly to businesses. Our report found that some businesses lost up to 100k Euro and a chain of retail outlets has been estimated to lose around $3000 per minute when their payment services went down during peak hours. Businesses spend an enormous amount of time and effort on optimising their platform, designing the user experience and creating campaigns to bring customers to the payments page and convert them. But these efforts take a huge hit when your payments platform goes down. Extended downtime and frequent system outages cause your customers to lose confidence in your brand, negatively affecting your online rankings and reviews. Multiple outages would also mean your advertising money is spent on recovering lost customers rather than expanding your customer base. But wouldn’t minimising downtime be better than managing its after effects? Here are a few questions you should be asking your payments partner to ensure minimal payments downtime. Infrastructure and uptime questions to ask your payment service provider. What is the Service Level Agreement (SLA) and uptime track record of your Payments partner? Payment service providers agree to a level of service uptime that they will provide. It is important to understand how a single digit in the uptime affects businesses. 99% uptime means, at minimum, 7 hours downtime every month! Whereas, 99.999% uptime would mean, 26 seconds downtime every month. What is your Payment Service Provider’s (PSP) topology and configuration? continue to shop and pay for goods and services. But what happens if, for some reason, this network working in the background fails? It is important that your payments provider has an active backup network (Active-Active configuration) which instantaneously takes-over if the first network fails. 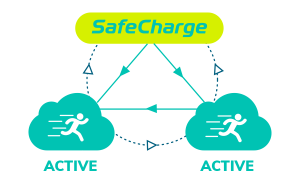 SafeCharge is able to maintain excellent uptime levels as we work on Active-Active configuration. How many data centres does your PSP have? A reliable payment service provider has more than one data centre. So, in case a data centre is down, the transactions are routed via another data centre to ensure minimum downtime for businesses while also ensuring quick restoration of service. SafeCharge has two data centres to cater to businesses and enable them to operate around the globe. How often is data synchronised between the data centres? When your customers enter their data on the checkout page it is securely updated on the data centre. When businesses work with a service provider with two data centres, it is important that this data is updated on both the data centres. At SafeCharge, this data is continuously synchronised, all the time. This means even if the transaction is routed, there are no gaps and all the data is up to date to give your customers a seamless shopping experience. And more importantly, no data loss for the business. How many transactions can your PSP handle? What happens at peak hours? The number of transactions per second is directly related to the number of gateways at a data centre. SafeCharge has multiple gateways per data centre. As a result, we can manage at least 20 times more transactions at any given time than the average. What’s more, we can easily add as many gateways as needed to give our customers the much-required support during peak hours and high traffic seasons. How often are servers monitored? To consistently manage the system uptime levels, the infrastructure needs to be robust and completely up to date. This happens only when advanced technology is put in place to keep systems updated and uptime monitored. At SafeCharge, the systems are monitored 24/7 – 365 days a year from over 30 locations across the globe. Who are your PSPs Internet Service Providers? Every payment service provider works with Internet Service Providers (ISP) that enable them to operate across the globe. Broadly speaking, there are three types of ISPs. Tier 1 ISPs are the backbone of the internet. These are the ones that allow data exchange between continents and own infrastructure such as the transatlantic cables and can reach every other network on the Internet! All the other ISP networks rely on these either partly or completely. 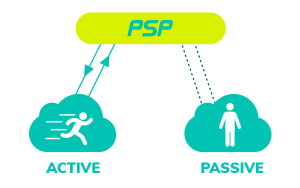 Any business that wants to ensure maximum uptime should partner with a PSP that works with Tier 1 ISPs. For example, SafeCharge works with three tier 1 Internet Service Providers to boast an excellent uptime record. Payment service uptime is important for every kind of business, more so during the high traffic peak seasons. Along with the expectations of high sales, many businesses would also be anxious to ensure their payments platform will keep up with the holiday rush. Think your payments provider can manage the upcoming sales rush?